I woke up this morning to 35 degrees and this…. This is Mt. McKinley, 20,320ft., yesterday when I arrived you couldn’t see where it was due to the heavy cloud cover. Obviously, I was disappointed but this morning at 5:15am this is what it looked like. Only about a a third of the visitors to the park actually see Mt. 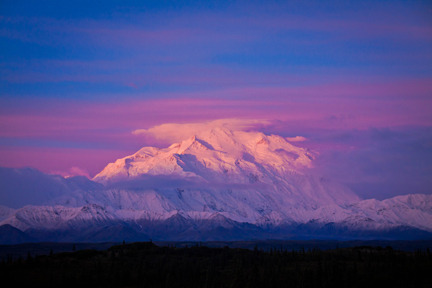 McKinley due to the cloud cover so I feel very fortunate. 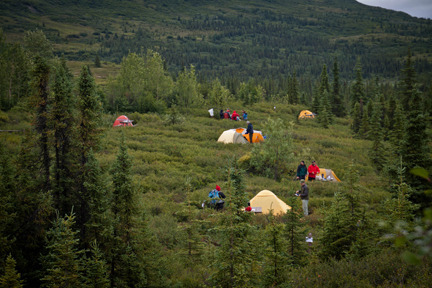 My tent is the orange one in the upper left. This is the Wonder Lake Campground and you can only tent camp here and you have to ride the park bus in. We had a full load of campers. It took us 4 1/2 hours to make the 85 mile drive. We stopped three times at rest stops for bathroom breaks and at a visitor’s center that is about 65 miles into the park. 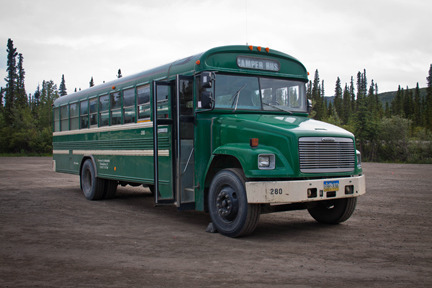 Vehicles can’t drive beyond 12 miles unless you have a pass to camp at the Teklanika Campground. That’s where I’d headed now for three days. That’s 30 miles into the park. 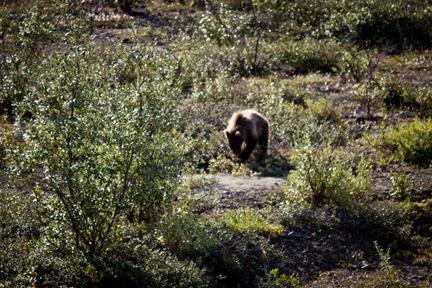 On our way back this morning we saw a couple of grizzlies. Here’s one of them. Just around the bend, we came upon this grizzley sleeping on top of a caribou that a couple of wolves had killed on Thursday. 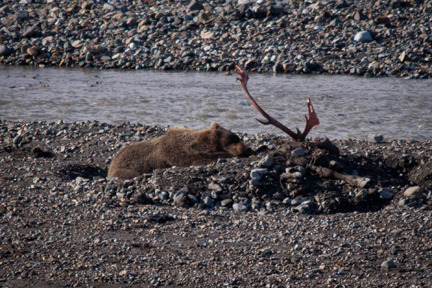 The bear has claimed what’s left of the carcass. You can see the antlers from the caribou. That’s going to be it for today. I need to get back to the campground to get my spot. I’ll have my next posting either Tuesday late or Wednesday.